The HeartMatters program will lead you to discover ways you can shift your life choices to create subtle, pleasant, and effective change, with the ultimate goal of enjoying radiant health and well-being. My holistic approach pays close attention to the connection between your body, mind, and spirit while incorporating science-based behavior change principles. How you feel about yourself, what you eat, how you think, your familiar self-talk patterns, your attitude toward stress and chaos, and how you play all contribute to your health. These choices, whether conscious or not, can also reveal challenges that might impede your success in living a healthy life. My coaching style allows a safe, guided, compassionately supported opportunity to explore personal change and work through your unique challenges. I deeply believes that we all have the capacity to change, and I have designed this program to help you do just that. 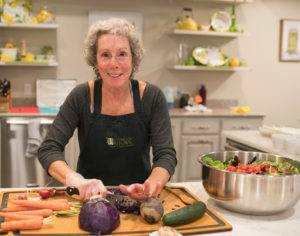 I will start with a gentle exploration of your health to include the status of your nutrition choices, physical activity routine, occupation, stress levels and responses, coping mechanisms, support systems, free time and relaxation activities, and any previous efforts you have made toward enhancing your health. In addition, I may suggest optional blood tests that would be ordered in collaboration with your primary care physician. These tests could include a chemistry panel, a lipid panel, and a C-reactive protein level. After a thorough review of the data, I will the assess your behavior change readiness and begin to customize your health management program. If we are able to meet for an in-person first session, this could include optional, additional assessments of your aerobic fitness, body mass index, blood pressure, lung capacity and post meal glucose level. Incorporating those results into my full assessment, we will then discuss the assessment, identify your change opportunities, from which I will help you create your personal Health Vision. I will guide you to set realistic, measurable goals that will support your success. You will start with two or three long term, three-month goals—built from your Health Vision—then create the small-step daily and weekly goals that will lead you towards successful attainment of your long-term goals. I will counsel you in the components of safe and effective exercise, teach you key nutrition concepts and introduce you to the very pleasant and integral concept of quieting your busy brain that results in a healthful relaxation response. The dynamic process of behavior change becomes a reality when a client begins to identify his health vision, from which we will create realistic small-step daily and weekly goals that allow for ongoing success and forward movement. Optimal health and life management is a long term commitment that is within reach–I believe that my expertise will provide the right direction. During weekly in-person or online Skype sessions, I will review your progress towards the last week’s goals, reinforcing your successes and supporting you in finding solutions for what you may have found challenging. Goals will be reviewed, and modified if necessary, for the following week. As each smaller goal becomes an accomplished, consistent behavior, you will gain confidence, satisfaction, and a sense of forward movement that will lead you to further successes. I will provide ongoing education as needed regarding nutrition, exercise, and your success with the relaxation response. Your optimal health management program privileges include unlimited email access for guidance and support. You will have the option of using tracking systems for behavior change that could include your food choices, exercise routine, and relaxation practices. I will assess your progress several times each week. To enhance your personal connection, and allow for deeper support of your goal attainment, successes, and healthful behaviors, I will be available to meet with you for an out-of the-office session(s). These sessions are designed to support you as you move forward, and may incorporate food shopping trips, cooking tips, deeper quieting and meditation practice, exercise participation, journal review, and discussion of any topic that will support your progress. Additional sessions can be discussed throughout the course of your behavior change program and are provided for a very reasonable supplemental fee. I will work with you to frequently assess your emotional health, happiness, productivity at home and at work, support systems, general lifestyle, fitness, nutrition choices (fast or slow foods, snacks, shopping, cooking, free time food preparation, accommodating work and travel), and relaxation practice. Please see the HeartMatters service page for more information.